CHS cover five counties with our Midland Commercial Window Cleaning Services – Staffordshire, Derbyshire, Nottinghamshire, Leicestershire and Warwickshire, and can undertake your entire window cleaning requirements. Over the years we have invested in the latest and most efficient window cleaning equipment available to give us the competitive edge when it comes to price. For example, the Ionic Thermopure Machines we use for all of our water-fed pole work utilities hot water to achieve the best results in less time than traditional methods, or even cold water water-fed pole systems. This enables us to be more competitive on our price as, simply put, we can do more in less time. This is especially relevant in this tough economic climate where budgets are constantly being cut, and the maintenance schedules becoming less frequent, thus the ability to cut through stubborn dirt in less time has clear economic advantages. Each site has its own specific requirements. We therefore tailor our services to meet these specific requirements by using a variety of access and cleaning methods. The majority of external work is carried out with the reach and wash method, this enables us to clean to a height of about six storeys achieving excellent results. This method is utilized as much as possible due to the clear health and safety and economic advantages. For work above this height, or harder to reach windows, we are in-house trained with IPAF licences giving us the ability to use cherry-pickers, scissor lifts and boom platforms making virtually all windows accessible. One of the specific requirements we often encounter is being able to work out of normal office hours to further reduce disruption and potential health and safety issues. This, of course, is no problem as we tailor site specific services from the risk assessment through to the completed task. We strive to make our service as simple as possible to leave you free to concentrate your energy on your core business. 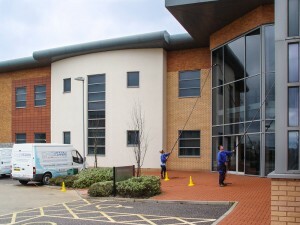 We cater for all commercial window cleaning work from one-off single site cleans through to regular multi-site regional contracts. Covering such a large area of the Midlands also has clear administrative advantages. If it is a multi-site contract you require, dealing with one Company for single point of invoice, having one Company’s details on file – contact details, Health and Safety Certificates, Insurance Certificates, etc, etc, and having the full knowledge that all of your Premises, Offices, Branches are being serviced to the same high standards. When we arrive at your premises/site, we arrive in fully sign-written vehicles; all of our operatives are fully uniformed so you know who are in and around your premises. We carry out the task in hand in a professional, low impact manner and we will not leave until you are 100% satisfied with the work that has taken place. For full peace of mind for all your window cleaning requirements, call CHS for a free no obligation quote.